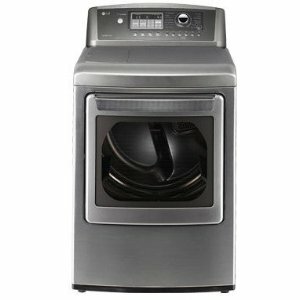 The LG DLEX5101V frontloader electric dryer is a time-saving and economical dryer. With a 7/3 cubic feet capacity, all clothes and linens dry in half the number of loads of conventional dryers. Plus, its SteamFresh Cycle diminishes the need for ironing because of its wrinkle removing capabilities. And when ironing is inescapable, as with the case of pleated skirts or pants, the EasyIron Option makes the chore more efficient and hassle-free. The whole process of drying is streamlined and made more effective. With the patented EasyIron Option, clothes are mildly dampened while still in the appliance. This makes ironing quicker and easier. Using TrueSteam Technology to cut the ironing time in half, the LG DLEX5101V also reduces wrinkles found on clothes and linens during the drying cycle. Eliminate bacteria from throw pillows or from other non-washable items with the SteamSanitary Cycle and prevent the risk of sickness and infection. Objects such as children's toys should be cleaned regularly. Things around the house, like throw pillows, could be handled by guests or pets and thus exposed to all kinds of bacteria. The SteamFresh Cycle makes the load come out refreshed and wrinkle-free in 20 minutes. The ReduceStatic Option also removes static cling so garments can be worn right from the dryer. The elegant NeverRust Stainless Steel Drum prevents wear and tear from prolonged usage. Along side the drum are a painted steel top plate and cabinet, transparent door glass and chrome door rim that makes the appliance aesthetically pleasing. The door rim could be replaced with a white one if desired. Having an LED Display and Dial-A-Cycle controls create a hassle free and touch-and-go system of commands. They are also easy to understand and with 14 drying programs to choose from, every load could be personalized and customized. Total capacity: 7.3 cu. ft.
Do less loads with the large capacity drum and thus save on money, time and effort. Have a peaceful time with your drying cycle with its quiet operations. Get rid of wrinkles and odors without having to iron your clothes. Keep non-washable items like children's toys sanitized with high temperature steam. Keep these objects from getting damaged from unsuccessful attempts at cleaning. Dry your clothes in the fraction of the time that other appliances do it. Less time using the appliance could save you money, time and electricity without sacrificing quality. Prices may be quite steep when compared with other dryers which may be a concern for more conservative buyers. Comforters and other heavier fabrics may need to be put through the cycle twice or kept in the dryer for a longer period of time.